Public service employment programs – what really have we go to fear? I was clearing out some old filing boxes today – I am moving offices soon – and came across a conference proceedings from 1976, which I had picked up somewhere in the 1980s when my own academic career really began. It was entitled: Directions for a national manpower policy : a collection of policy papers prepared for three regional conferences and published by in Washington by the US National Commission for Manpower Policy in 1976. There was a chapter in it that I recalled fondly by US economist Charles C. Killingsworth entitled Should full employment be a major national goal. He was a long-time advocate of public employment programs and understood how lacking my profession is when it comes to caring about people. In terms of public service employment programs – what really have we go to fear? Answer: not much, unless you don’t enjoy the most disadvantaged having a better life! Tomorrow morning in Washington there is going to be an announcement of momentous significance. About 14 hours from now the Department of Labor is going to tell the waiting world what the new unemployment rate is. Part of its importance, of course, lies in the fact that this will be the last unemployment figure announced prior to the election. I’m not going to tell you what the figure will be. I will make a prediction that I think is completely safe. Whatever the number is that they announce tomorrow morning, it will be the highest unemployment rate of the entire postwar period after 18 months of recovery. Now let me say that again. The number that will be announced tomorrow will be the highest unemployment rate this country has experienced since World War II in the 18th months of a recovery from recession. 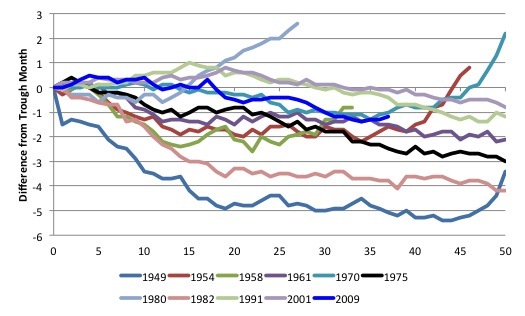 I say that in all seriousness because I think that the point is that the current economic recovery has done less to reduce the unemployment rate than any other recovery in our post-war experience. Charles Killingsworth takes his audience back to the late 1940s to focus on the unemployment rate – “not simply because of historical interest but because I want to try to identify some lessons from it”. I’ve prepared a chart … to illustrate a point regarding the behaviour of the unemployment rate during these recovery periods. What I have done is take as the starting point the unemployment rate in the trough month – that is, the turning point, the month in which according to the National Bureau of Economic Research the recession came to an end and the recovery period begins. The chart shows monthly changes in the unemployment rate following the trough. The standard business cycle dating for the US that he refers to comes from the US National Bureau of Economic Research who provide a table of US Business Cycle Expansions and Contractions. 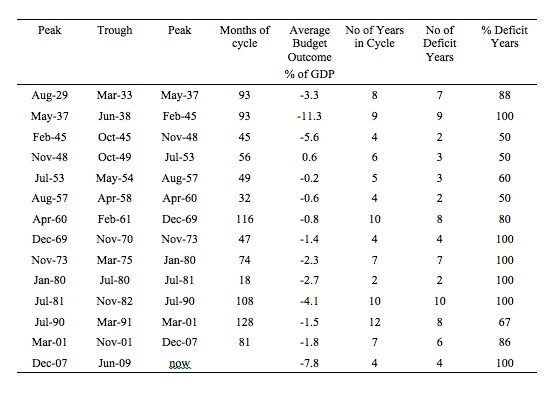 The following table presents a summary of the NBER recessions since the 1930s. I have updated his graph (Changes in the Unemployment Rate for the Civilian Labor Force in Months Following Trough of Five Postwar Recessions) using the latest US Bureau of labor Statistics Labour Force Data (to July 2012). The black line is the recession he was referring to in the opening. The relatively bright (lurid?) blue line is the current recession. I have included 50 months after the recession trough for comparison. The response in the current recession was worse than the recession that Charles Killingsworth was worried about. To put the current recession in more historical perspective I also graphed the US national unemployment rate (%) from January 1948 to July 2012. Only the short-sharp 1982 recession when the unemployment rate peaked at 10.4 per cent has seen a worse result than the current recession. In terms of the recession in 1975 that Charles Killingsworth was horrified by the peak then was 9 per cent. Indeed, all of the subsequent recessions have been worse in the recovery response. 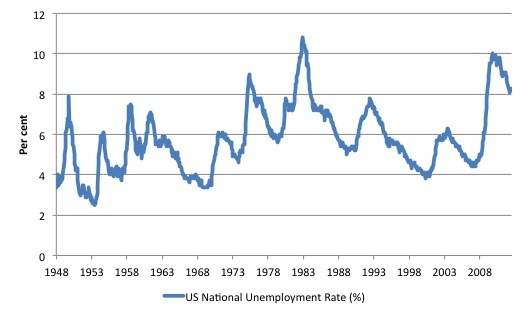 The period since Charles Killingsworth wrote the article (based on a speech at the conference noted above) just happens to be the period that coincides with the abandonment of full employment as a legitimate policy goal by national governments and the substitution of the neo-liberal concept of a Non-Accelerating-Inflation-Rate-of-Unemployment (NAIRU) for the previous concept of full employment. Please read my blog – The dreaded NAIRU is still about! – for more discussion on this point. It may come as a surprise to those of you that take this goal for granted, but there are a great many people who would answer that question with a resounding “no–full employment should not be a national goal”. In fact, some of the statements that have been made during the past year by quite prominent and respected economists would lead you to believe that it would be nothing short of a national disaster to achieve full employment in this country. Some have actually used those terms. Full employment would be disastrous. Economics has been called a dismal science for a long time but rarely has that characterisation been as justified in the the last couple of years. At each turn of his argument I felt that we were just re-living the same sorts of arguments that he came up against in his day. At that time, the profession had been stormed by Friedman and the natural rate of unemployment gang and the notion of Keynesian fiscal policy was considered lunacy. This was the beginning of the Monetarist onslaught that evolved in the 1980s into the vapid and rabid belief that self-regulating markets would deliver the highest wealth to all of us. The privatisation and deregulation accompanied that mantra. At that time, any notion that the government might use fiscal policy or direct job creation was being attacked with arguments that it would cause spiralling inflation and, eventually hyperinflation and that interest rates would soar as bond markets lost faith in government debt issues. The same narratives that we hear each day now were being played out then – nothing much has changed. They were wrong then and continue to be wrong. … too many of us have been intimidated for too long by the many prestigious economists and others who have been telling us that manpower programs don’t work; that the only way to reduce unemployment is to cut taxes; and that if you cut taxes enough to approach full employment, you will have an inflation and destroy the country. The economics establishment is wrong about this diagnosis, as it has been wrong so many times before in the last forty years … The crucial point is, what quality of life will we choose for our country? I say that we can continue our present course and slip further into the fortress society, where the majority of us sit behind triple-locked doors and try to think of more ways to protect ourselves against the miserable, bitter, dangerous underclass outside. Or we can, if we choose, make full employment a major goal of this great country and start moving in the direction of a stronger, more secure country and a better quality of life for all of us. So if we do some arithmetic and add the 36 years since 1976 to the forty years prior to 1976 then the “many prestigious economists and others” have been wrong from around 76 years! In fact, it would increase GDP by considerably more because some of the tax cut will be lost to saving and it is highly likely the marginal propensity to consume of those given wages in the program would be higher than the national average. While that is “elementary macro-econmics”, Charles Killingsworth noted that “it is almost totally ignored in the current discussions of employment policies”. I do want to say that I’m aware that a great many people have a kind of knee-jerk adverse reaction to the idea of creating more government jobs. I think that a mental image appears of a clear sitting down at a desk between coffee breaks, moving pieces of paper from the in-box to the out-box, and leaving a half hour before quitting time. Now I don’t care much for that kind of job either. If that’s public service employment, I not really enthusiastic about it. But I think that image is the product of a poverty of imagination. He then described the way, as an example, the way the public education system had been reduced by bean counters intent on budget savings. The type of jobs eliminated included teacher aides and paraprofessionals, non-core jobs which add to the efficiency of the core jobs (the teachers). I can visualise creating several hundreds of thousands of this kind of job alone. This is the kind of public service employment … that makes sense … I think that it would not take a great amount of straining of the imagination to come up with other approaches, other kinds of employment that would make just as much sense as that one example. He closed that section of his talk by saying that PSE programs are not the “panacea” but part of an overall solution to restore full employment. He did feel that PSE programs would be the largest part of an effective strategy. I have written about PSE programs before – often. I consider the first policy a government should put in place is a Job Guarantee. I admit that I have studied this topic for so long in so much detail that I lose touch with the fact that it is not blindingly obvious to everyone that PSE programs should be a baseline strategy for national governments. In this blog (from April 22, 2009)- Boondoggling and leaf-raking … – I consider the put-downs against PSE programs. Boondoggling and leaf-raking – it is the term that invokes the ultimate put down by the conservatives who laud the virtues of the private sector as they create hundreds of thousands of low-skill, low-paid, precarious and mind-numbing jobs but hate, with an irrational passion, the idea that the public sector could employ workers that the private sector doesn’t want and get them to work on community development projects at a minimum wage. And to put a finer point on it … on projects that can leave massive positive legacies to all that follow. I am currently working on a presentation for the up-coming Jobs for Europe: The Employment Policy Conference – which the European Commission is staging in Brussels on September 6-7. I have been invited as a speaker to discuss employment guarantees. I was very pleased to be invited by the Employment, Social Affairs and Inclusion Commissioner, who is organising the conference. I will rehearse all the unimaginative and wrongful criticisms of large-scale PSE programs. In the blog I link to above I consider many of them. Many of them – from those that espouse the primacy of market forces, actually reflect their fear of letting market forces work when it comes to providing advantages and opportunities to the most disadvantaged workers in our communities. The critics prefer to keep this disadvantaged cohort suspended in a void of joblessness and cycle them through clearly irrelevant training programs. They seemed to distrust the ability of the private sector to structure interesting and attractive jobs to lure workers away from Job Guarantee positions. Remember, that the Job Guarantee I provide and which forms an integral part of Modern Monetary Theory (MMT), provides buffer stock employment to anyone who wants such a job at any time at any fraction of a working week. It is an unconditional fixed wage offer to anyone by the Government. That is a very powerful aspect of the proposal as it means the Government ‘hires off the bottom’ rather than the top and can never be a source of inflationary pressure. Further, the private sector can employ the JG workers any time they choose. All they have to do is provide a better “market” opportunity. That would encourage dynamic efficiencies because the incentives would be there in the private sector to improve productivity and on-the-job training to ensure that the wages paid were profitable. Others argue that the JG workers might never want to leave the Job Guarantee despite the fact that the private sector has complete scope to hire out of the Job Guarantee workforce by simply offering attractive employment conditions. To think that the workers would never be lured out of the Job Guarantee is to display a staggering lack of confidence in market forces. Moreover, what a shocking thing it would be that the workers who have been unable to find work because the economy has failed to produce enough jobs (due to deficient macroeconomic policy) might actually enjoy working for the safety net wage. Wouldn’t that be something to regret! It is better to keep them unemployed doing nothing and feeling the various social stigmas that are continually placed on them by Government and the media than to give them a job that is adding value to our communities and get them off the welfare rolls! Why is it better? Because they might like the jobs! In the cited blog I consider many more arguments in detail and if you are feeling angst as you read this I urge you to confront your negativity by learning more. Charles Killingsworth was an old-style economist from the great US institutionalist tradition. He had an advanced understanding of economics but also maintained his empathy towards humans. I gave a talk last week in Grafton, NSW to a group of citizens that were attempt a grassroots movement to take on the neo-liberal attacks on their services. The town (and region) had recently lost its major employer as the NSW state government shut the prison to save money. It was obvious that the treasury had taken this view without the slightest regard for the human dimensions. For example, it is a very disadvantaged area and the prison had a high proportion of indigenous Australia inmates (them being among the most disadvantaged peoples in the world). The prisoners were shipped off to other jails some 7-8 hours by road (longer by public transport) away – from their families and support bases. That effectively withdraws that essential support from these prisoners given the families are unlikely to be able to afford to travel those distances to visit etc. The bean counters counted the dollars saved but I bet they didn’t have a column for human suffering in their calculations. The same goes for attacks on PSE programs. If we thought people first and realised that the only costs of such program are the extra real resources that would be required to mount the program and attributable to the extra consumption possibilities that the JG workers would be able to entertain (from close to zero to not very much!) then our responses would be vastly different. Bill – glad you’ve been invited to speak. Interesting to see “job guarantee” specifically mentioned on the agenda… somehow I expected them to avoid mentioning it despite inviting you. Bill, Why do you bother with JG? You claim that the basic idea behind NAIRU is invalid (i.e. that there is a relationship between inflation and unemployment). Well if the latter is true, why not just engineer a huge rise in demand? Since there is (according to you) no relationship between inflation and unemployment, no extra inflation will ensue from that rise in demand. Unemployment will come crashing down. Problem solved!!!! No need for JG. Bill, I look forward to your contribution at the “Jobs for Europe” conference, as you say why not try JG, what exactly does anyone have to lose? If it works, more of the same, if it doesn’t then lets try something else and MMT withdraws with it’s tail between it’s (collective) legs. It does work, anyone with any sense can see that is has and (if only they tried it) could. For any goverment (or society) to sit on it’s hands and say “nothing to do with me, not my fault, I have a job” then blame the people being made redundant for their predicament is to abdicate responsability for some of the most vulnerable people our society produces. I fear especially for our young people, there is much talk of (olympic) legacy while ignoring the one that is staring us in the face; that of unemployment and poverty for a generation. The claim is that you can’t measure it and you can’t see it – it can only be feared. It cannot be scientifically validated. Therefore you must take the alternative approach – employ everybody and dampen inflation to *that* point – something you can actually measure and see. NAIRU is constructed as it is because politically the people that support the concept don’t want to eliminate the ‘reserve army of the unemployed’. Interesting article on industrial robots in the NYT; Skilled Work, Without the Worker. Generated about 500 comments. May need to reexamine labor based compensation while exploring self-extinguishing money, which also self-extnguishes the deficit. SEM can eliminate hoarding, credit money debt and wealth inequality while allowing living standard differences. Cash flow, but not too much, becomes the goal. Compatible with JG. Many people dont realize how little these JG programs cost. Let’s say that some european government wants to offer a job for 50.000 long term unemployed, and the cost over existing unemployment benefits and after deducting increased tax revenue is 500 euros a month, that would cost 25 million euros a month or 300 million euros a year. Even EZ governments can afford that much. You claim that the NAIRU concept is invalidated by the fact that it cannot be measured. That is certainly a problem with the concept. On the other hand governments just HAVE TO make a guess as to what the maximum possible level of employment is without exacerbating inflation too much. They’ve no alternative. And governments by the very fact of making that guess are saying implicitly that the concept is valid. Also science is full of concepts / variables which cannot be measured with any great accuracy, but which are quite clearly valid concepts. E.g. NASA when landing a robot on some planet might not know what the maximum likely wind speed is on the planet. That does not invalidate the concept “wind speed”. Plus NASA would just HAVE TO make a guess at the likely maximum wind speed and design its robot accordingly. Re the idea that supporters of the NAIRU / natural level idea don’t want JG in any shape or form, where is the evidence for that? Take me: I back the basic NAIRU concept (i.e. I think there is a relation between inflation and unemployment) plus I favour JG in some shape or form. The US Government could put 20,000,000 to work at $25,000/year for $500 billion/year. That’s a bargain, and it’s a paltry amount compared to the financial bailout. Government jobs are clearly not always a good thing. For example, in reviewing the list of economists whose names appear at “Economists for Romney“, one notes that somewhere between 40-50% of these 400 or so economists are employed by state-owned universities. No doubt when these economists advocate against government employment, they are also requesting that their own jobs be terminated? Ralph: Nairu is just an incoherent, oversimplified, confused “concept”, with few ideas behind it. Keynes & Lerner understood and wrote about the inflationary possibilities of “Keynesian” demand management – the relationships between inflation and unemployment -“the basic idea”- long before the second-rate imitations of the natural-raters. If one hires off the top, demand-manages by giving to the usual suspects / parasites , then you are going to get inflation before it trickles down to eradicating unemployment. Targetting the “bottom”, targetted demand-management aimed at unemployment, is a JG in all but name. You don’t see the JG as engineering a rise in demand? pebird: You don’t see the JG as engineering a rise in demand? According to Warren adding demand is not the purpose of the JG and it doesn’t matter whether it does or not. Managing effective demand should be addressed through fiscal policy base on sectoral balances and functional finance. The JG would be of only minor importance fiscally. It’s importance is providing a buffer stock of employed regardless. It needs to be recognized that the way “inflation” is presently used is normative rather than scientific, as misrepresented. Inflation and its rates (1st and 2nd derivative) are not observable and measurable as presently defined. They are estimates subjectively arrived at methodologically. That is, they are guesses. It’s crazy running a command system for managing the economy based on a small cohort of technocrats using interest rate setting to “control inflation.” It’s magical thinking if not voodoo. I agree. Money creation is an art, not a science, and artists must be free, eh? Thus we should have freedom in private money creation but for private debts only and government money should only be legal tender for government debts. That way, the government could freely spend without damaging the private sector and private sector monetary mismanagement would not affect the public sector. Money creation is a problem profoundly rooted in ethics. Government is force and the private sector should be voluntary cooperation. How can only a single money supply possibly serve both? I think this is a point which is overlooked. Bill often seems to be saying ‘they don’t understand’, but I suspect many supporters of NAIRU, etc., understand quite well. Quite so. The only reason to assert NAIRU is factual, with absolutely no empirical evidence, is to advance the idea that some level of unemployment is desirable. Mankiw and Ball’s work in identifying NAIRU is intended to allow central banks to “target” how many of the unemployed should be left to languish. Inadvertantly, I think that you have hit on the truth of the matter. I’m a recent Economics graduate, but earlier earned a degree in Psychology. As such, I have some interest in how economic beliefs are formed. It is known from primate studies that our closest cousins tend to organise in hierarchical societies in which an individual works feverishly to maintain his/her position. As members of massive societies, i think that we no longer have the ability to judge our hierarchical position except in the most general terms. So, as we know from social and economic research, people compare themselves most often to those in their immediate circles, hence the belief of many millionaires that they are somehow ‘doing it tough’. In addition to this, I suspect that as we all know that, while our own position may be uncertain, the unemployed and low paid are definitely lower in the hierarchy. Resisting measures that would make their lives more comfortable might be a way to maintain positional distance. One need only look at a news site comments sections underneath current stories about school funding to see that many want advantages reinforced, not eroded! As you say, much of Economics is lacking when it comes to caring about people. Unfortunately, it has been easier to sell the neoliberal idea that ‘your taxes shouldn’t be spent helping the poor’ fallacy to those who aren’t interested in economics (or other social sciences) and has reinforced the positions of theorists promoting the worst aspects of our collective behaviour. I’m sure that you have considered all this before, and apologies for the long post. As I recall, in the 70’s, it was cost push inflation caused by energy and some frigid winters. It started with a gasoline shortage and then escalating heating oil and diesel prices peaking in 1980. My mortgage payment doubled. Took on a roommate to keep the beer flowing. We played cribbage every night, beer a point, a case a game, double for a skunk. You didn’t spend money on anything else, stores were empty. Of course there was unemployment. Heated the house with a woodstove after tossing the oil burner. Those were lean times. NAIRU is a fairytale. The system is shocked, people stop consuming wants, there are lay-offs. JG is a stabilizer that occupies empty hands and minds productively. I know that L. Randall Wray, who Bill Mitchell speaks highly of, has often said that we should not discount the element of cruelty in thinking about why the economy works the way it does. Your comment gives me a better understanding of why that might be. Having studied at Newcastle, I’ve been exposed to a bit of L. Randall Wray through Bill’s colleagues. Do you have a reference for his suggestion that cruelty plays a part? I’d be interested to read more. I know my thoughts are hardly original, but I really do think that antipathy toward the less fortunate comes from our simian roots. If only we were more like Bonobos, and less like Chimps! Also, this is probably very off topic, but when it was outlined in undergraduate lectures the Friedman notion of us all as rational actors seeking only to maximise utility it reminded me of nothing so much as Skinner’s Radical Behaviourism, the idea that we are all automatons for whom past rewards and punishments dictate current and future behaviour. In the same way that Harlow’s experiments with Rhesus monkeys demonstrated that maternal kindness is more important in the short term than the supply of milk, so it is necessary for economists such as Bill to show that the quest for a meaningful life is a more powerful motivator for many than just financial rewards. Veblen knew this more than a century ago, how can this knowledge have been lost? One reference is at Wray’s MMT primer. http://neweconomicperspectives.org/p/modern-monetary-theory-primer.html . Check out blog #42. Don’t know much about the other primates but I do have a lot of problems with utility theory. I found MMT last week. After finishing MMT primer by Randall Wray, I am convinced that MMT’s explanatory power is better than degenerative paradigms of mainstream economists. Imagine a world where 80 percent of folks are unemployed. And govt uses JG or a similar program to pay these folks for whatever work they do for the govt/public purpose. These 80 percent folks increase the profit for private corporations. If you think through this experiment, asymptotically, the private corporations will accumulate enough financial assets (dollars, t-notes, what not). What do they do with these assets? Sure, they can acquire private assets, in which case the assets get transferred (and the net is zero). Maybe, this will create an opportunity to the buy off the government with the financial assets they have acquired. Then, we are left with corporations being the government. What do they wanna do then? Starve people to death? Or wait for a revolution. The other thing is the very notion of corporations. These entities are run by many short-term thinking folks, who just wanna make a quick buck and move on. There is a lack of coherence among them in terms of the long term implications. The lobbyists, the politicians the former bought, the ideologues that the corporations sponsor, etc–all these folks are there for the short term: make as much money as for more than 5 generations and protect whatever financial assets they have acquired. In the short term, by providing jobs to the unemployed, it appears that the assets the other folks have already accumulated will loose the relative value. That’s why they are against providing jobs for the unemployed. Humans are selfish, and they wanna protect themselves, their family, and the posterity. So, this is kinda playing a huge role in many policy debates. Which means you back unemployment – as you do subsidising the profit share. That’s merely a political position. I back employment for all that want it, and I back profit makers who have to fight for their profit in a safe effective market place. I want lean Cheetahs that hunt Gazelle with their impressive speed in a well managed Reserve, not lardy ones that get hunks of meat given to them every day because we’re frightened they might die off otherwise. I fully accept that NAIRU is nothing more than a minor variation on ideas put by Keynes and others decades before the term “NAIRU” first appeared. I’ve been aware of that for decades. In fact my reaction to the NAIRU versus “natural level” argument has long been to yawn or go to sleep. And not only that, but I’ve always found the Phillips curve a statement of the bleeding obvious. But that doesn’t invalidate the basic idea behind NAIRU / “natural level” / call it what you will, and that is simply that there is a relationship between inflation and unemployment. Re your claim that “hiring off the top” results in inflation, my answer is “not if unemployment is particularly high / above NAIRU / above the “natural level”. I.e. given a large volume of unused resources (skilled labour, unskilled labour, capital equipment, etc) one can perfectly well have a straight rise in demand (i.e. “hire off the top”) and inflation will not go thru the roof as a result. It is ridiculous to say that someone who “backs the basic NAIRU concept” also “backs unemployment”. The basic NAIRU / natural level concept (to repeat) is simply the statement that as unemployment falls (absent unconventional measures like JG) inflation will rise to an unacceptable level. That does not mean that advocates of the NAIRU / natural level concept welcome unemployment. I’m sure it makes some advocates of JG feel good to ascribe evil to others. I’m afraid that sort of argument doesn’t fool me. Moreover where in earth is the evidence that advocates of the NAIRU / natural level idea tend to oppose JG? I cannot for the life of me see any reason why they should. I just don’t see the logic there. To me, that’s a bit like saying that people with long legs tend to be on the political left. Of course it’s POSSIBLE that people with long legs for some strange reason tend to be on the political left, but on the face of it, I see no logical connection between having long legs and being on the political left. Of course it does. It has ‘rate of unemployment’ in the title and ascribes it as being ‘natural’. If you can’t see that entire title promotes unemployment as ‘unavoidable’ then you have been very well indoctrinated in your beliefs. Similarly with the concept of subsidising profit makers, which I notice you’ve avoided yet again. It’s completely the wrong construction of the argument and the concept. The argument should be constructed in terms of invariant full employment, where everybody who wants to work has work and an income, and what the level of income and taxation redistribution is required to make that consistent with stable prices. That then depends on how much ‘paradox of productivity’ there is in the country, the anchoring effects of employment buffers, and what room leakages to savings gives the state. There is no natural rate of unemployment. It’s entirely un-natural. 31 cubic ft. I wonder how that compares with the amount of stuff in Bill’s office? So have I got this right: anyone who thinks there is a relationship between inflation and unemployment (that’s 95% of the economics profession) is an evil pro-unemployment, anti-employment scumbag. Re “subsidising profit makers”, several hundred different “subsidies for profit makers” have been implemented and/or proposed in the West since WWII. Again, about 95% of the economics profession have no objection (in my view quite rightly) to the basic principle that subsidies (and taxes) for the private sector are sometimes in order. E.g. the mortgage industry in the UK is subsidised. Private pension provision is also subsidised. Manufacturing was subsidised under the Selective Employment Tax we had in the UK several decades a go. I could go on. Appeals to authority and emotion are logical fallacies Ralph. So I’ll ignore those. It’s those who think there is a relationship between *employment* and inflation that have the construction correct. And that is a key difference – the correct viewpoint on the relationship. Because viewpoints matter. Employment is Natural and the natural rate of employment is that everybody who wants to provide a living for themselves can do. If inflation disturbs that natural order then it has to be dealt with appropriately *in the context of the notion that employment is natural*. Again because private subsidies have been put in place ‘in the past’ doesn’t mean that they are appropriate or sensible. And the main reason is that it creates a moral hazard. You are picking winners, generating rent opportunities and distorting markets. If a market system is to function effectively it has to be left to its own devices within a simple framework where the control functions work to eliminate any asymmetry. Introducing asymmetry is the wrong solution. As my example shows it can lead to elimination of machines and replacement with manpower. Things they teach have been carefully constructed to lead to certain political outcomes, that are deemed desirable. In economics profession, politics always triumphs truth. JG gets round the difficulty of knowing when capacity is “full” by further automating the automatic stabilisers, it does so by directly targeting a major root cause of the problem, a rising tide lifts the lowest boats first.